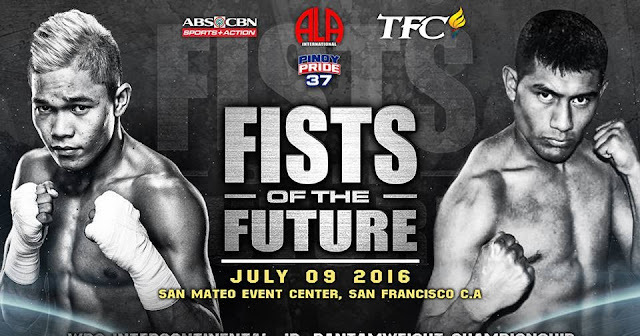 Check out the complete fight card of Pinoy Pride 37: Fist of the Future headlined by the Filipino prospect Prince Albert Pagara and the Mexican tough opponent Cesar Juarez. Undefeated Albert Pagara 26W(17KO)-0L of the Philippines to face the former world title challenger from Mexico Cesar Juarez 17W(13KO)-5L. WBO no. 1 super lightweight contender Jason Pagara 38W(23KO)-2L of the Philippines fights another Mexican warrior Abraham Alvarez 21W(10KO)-9L-1D. Undefeated hard hitting American boxer Hector Valdez 6W(5KO)-0L to fight Vincent Jennings 5W(4L)-1L who also from USA. Maurio Zavaleta 2W(2KO)-2L vs Darren Mallard 3W(1KO)-1L. Pinoy Pride 37 will be telecast via satellite on ABS-CBN Channel 2 on July 10, 2016 at 10:15AM.